The team will receive $2500 in cash. Each member will also receive a round trip plane ticket and a VIP Pass to the Techweek 2016 conference city of their choice. The runner up team will receive 5 Attendee Passes to the Techweek 2016 Conference of their choice, (valued at approx. $500). The winning team will receive a Parrot MiniDrone Jumping Sumos and Beats by Dre headphones. 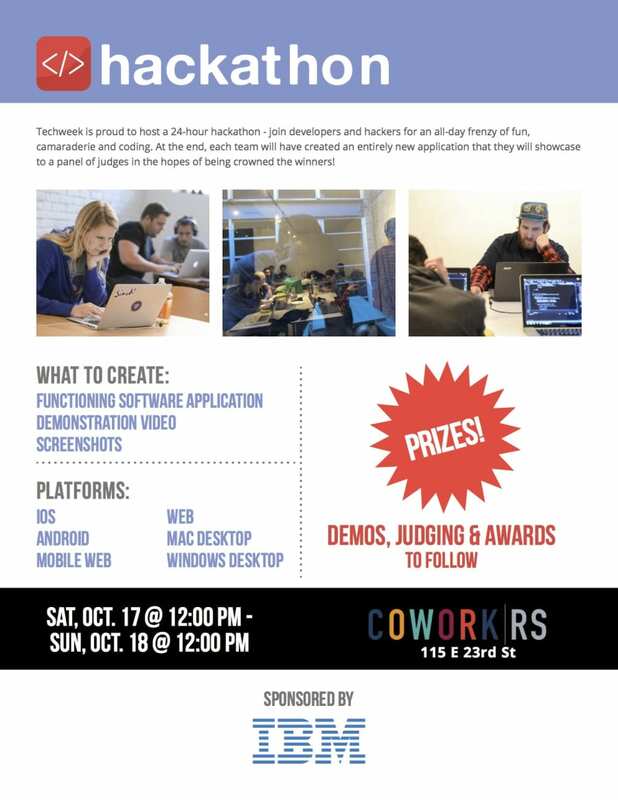 Techweek is proud to host a 24-hour hackathon - join developers and hackers for an all-day frenzy of fun, camaraderie and coding. At the end, each team will have created an entirely new application that they will showcase to a panel of judges in the hopes of being crowned the winners! Bluemix is the open cloud platform of IBM built on Open Source technology. You can use IBM Bluemix for cloud hosting, with simple quick-start applications for Node.js, Python Flask, Ruby, PHP httpd, and Java. Or use any of the IBM Watson API services for machine learning, image recognition, IoT services, Mobile services, big data analytics, or 3rd part API services like Twilio, SendGrid, Box, Geocoding, MongoDB, Elasticsearch, SOLR, Hadoop, Spark, and more. Score points for hosting your app on Bluemix, using any of the API services, and creativity! 12PM - 12:30PM: Kickoff: Arrive, socialize, and form teams. Teams can consist of one but no more than five. Teams of eligible individuals may enter on behalf of a company, non-profit, and other legal entities may enter. Are you solving a real problem in an interesting way? You are not required to explain how your app makes money, unless that is part of the problem you solve. How will did you present?